Diverticulitis is a digestive disease of the large intestine. Diverticulitis develops from diverticulosis, which involves the formation of pouches (diverticula) on the outside of the colon. Diverticulitis results if one of these diverticula becomes inflamed. A diverticulitis diet is not a treatment for the disease but gives the digestive system a chance to rest, as the constipation and straining during bowel movements can worsen the condition. Sufferers may be recommended to eat a diet at home if the diverticulitis signs and symptoms are mild. Those experiencing worsening signs and symptoms or who can't keep liquids down may need to be hospitalized for diverticulitis treatment. During initial attack of diverticulitis, stick to a clear liquid diet for two or three days. Foods and beverages allowed on a clear liquid diet include fruit juices without pulp, clear vegetable juices, soups, water, broth, milk, puddings, custards, ice cream. Once signs and symptoms begin to resolve you may slowly introduce low-fiber foods. A gradual fiber increase will add bulk to the stool, allowing it to pass quickly and easily. Rapid fiber increase may result in gas, cramping, bloating, or diarrhea. Dairy Products: Allowed: Milk, yogurt, cheese and as recommended by dietitians. When symptoms of diverticulitis improve, you may ease off the above diet and gradually add more fiber back into your diet. Aim for at least 30 grams of fiber each day. High Residue (Fiber) Diet: As you increase your fiber intake, increase your fluid intake as well Allowed: Brown rice, Fruits, Vegetables, Legumes like lentils and pulses Whole-grain cereals that include wheat, bread, bran or oats. 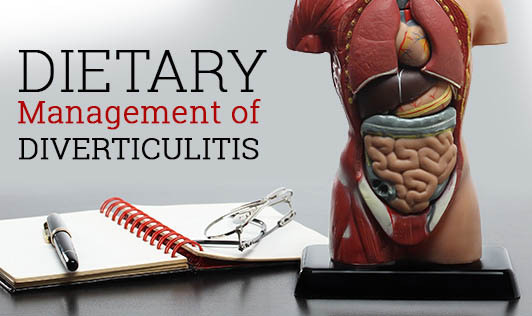 Consult your dietitian for a detailed diet plan for diverticulitis.